When local social activists convinced real-estate developer Paul Tamburello to purchase an abandoned 20,000 square-foot greenhouse in Denver’s Elyria-Swansea neighborhood, it wasn’t much more than memories of a cut flower processing plant. The team reached out to the community to ask how to reimagine the space. Together they created The GrowHaus, a nonprofit indoor farm, marketplace and educational center that serves as a hub for food distribution, production, education, and economic opportunity. 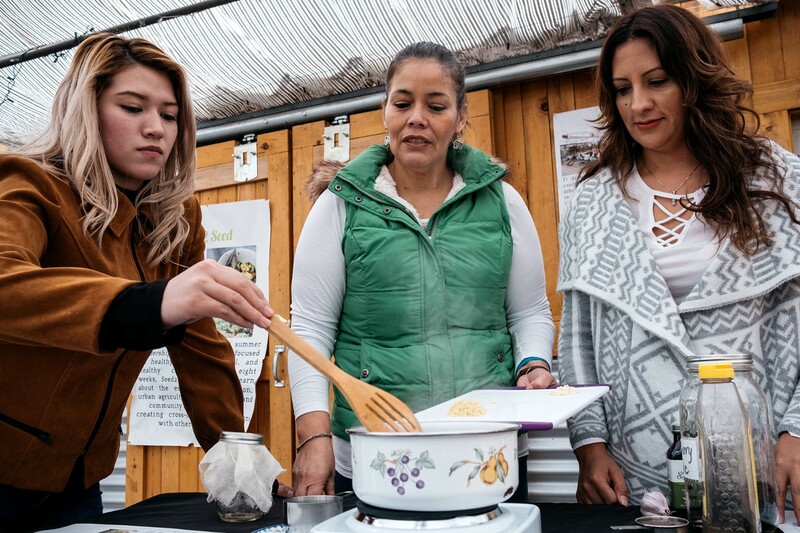 After several years of building the space, launching three program areas, and expanding their community outreach initiatives, The GrowHaus team realized they needed to build program and organizational stability to scale in a healthy way. Executive Director Kayla Birdsong, Director of Food Initiatives Kathryn Ardoin, and Director of Development Nathan Mackenzie attended Uncharted Food Access with the goal of taking a step back as a team to look at this next stage of growth. At the program, Uncharted connected The GrowHaus with mentors who continue to help the team pursue that goal. Mentor David Kyle, former COO of Acumen, dove into working with the team on their strategic plan and general organizational thinking, a process that is currently ongoing. Meanwhile, Kayla connected with Kate Brown, founder and president of Boulder Organic. Through their ongoing mentor-mentee relationship, Kate has guided Kayla on her transition to Executive Director of The GrowHaus, focusing on empowering women in the workforce, big-picture visioning, and team building. After the program, Kathryn connected with Robert Egger, founder and president of L.A. Kitchen and previous president of DC Central Kitchen, who has helped Kathryn and the team think about how they can adapt or improve their food distribution programming. Read the whole story on Medium!